My precious mommy died today. Curly was broody but we had no fertilized eggs to place under her. We bought a large batch of guinea eggs and put them under Curly. We heard that hens make better mothers for guineas than guineas do. The first tragedy for those eggs occurred when post-partum Beulah Dean started busting them. We finally got that straightened out and Curly has remained steadfast on the nest protecting these eggs with a vengeance. Monday a black snake got into the nest and swallowed seven eggs. With eleven eggs left we crossed our fingers for success on her hatch date of July 26, 2007. Yesterday, July 24, 2007, I drove to Tulsa. When I got home I checked the chicken house and there, two days early, was a hatched guinea chick. This morning we have six healthy chicks if our count is right. More could still hatch. They are the cutest little things. They are much smaller than chicken chicks. Our 2007 summer of chicks has not been hugely successful. We have 10 left of the 19 incubated chicks born on Easter. We have Tiger Lily’s one chick Elvis (and therein lies a gripping story of a fowl Oedipus complex). Beulah Dean has no surviving chicks due to her murderous rampage. Perhaps these guinea chicks will prove the most hale and hearty. I wonder what will happen if Curly learns we tricked her? We will continue our efforts to increase our flock. It seems like two steps forward and three steps back. But, as new eggs hatch, hope springs eternal in the chicken pen! My sister stopped by yesterday on her way home from Tulsa. She had a quiet day with our mother. She had spent the previous day with my children pretending to be me (and that's another story). My sister is a saint and an angel and she was exhausted from her most recent missions, so I was thrilled to offer her a brief respite. We shared a pot of fresh coffee and she reported on everything she knew and I reported on everything I knew . I filled her in on the visit from the grandchildren last week. I remembered the pictures Michael had taken of my chickens. "Oh, I want to see them!" Elenore exclaimed. I was very excited to sit at the computer and put up a slide show of Michael's creative photos. I was naming each chicken as the picture came up and giving a little background of vital statistics , reasons for their selected names, the dates each hatched, etc. Suddenly I turned around to see the excitement I knew Elenore would have for all these wonderful pictures by my 12 yer old grandson. Instead I saw a bit of a look of boredom and a bit of dazed shock. "I cannot believe we are sitting here looking at pictures of chickens!" my sister said. It is difficult for my family to get swept up in my newest career choice. They do, however, appreciate the eggs......and Elenore truly appreciated Michael's photography skills! I am quite sure that Ryan, Dillon and Beth are in line somewhere in Tulsa, or were in line last night at midnight, awaiting the purchase of the new Harry Potter book. They, along with millions, have been excited for this important day and have had their calendars marked. It is a regular routine for them. It makes me happy to see all our grandchildren eager to read. They always have a book tucked under their arms. Fiction, non-fiction, or instructional manuals, they are drinking it in. Our family members know what an emotional week this has been. My precious son and daughter have been tested to the limit and excelled through love. 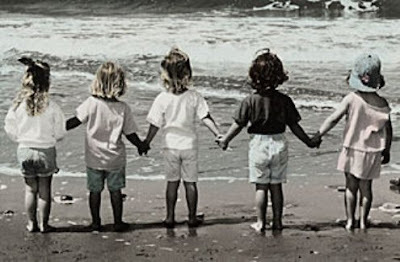 In a way we have all been standing in line and it is a breath of fresh air to have the little children lead us all back to the real world. Waiting for Harry Potter it's business as usual. Jamie Dawn has added me to her blog roll. Now the pressure is on to be more than I can be....... At least I can join the mission to make hitonious a word! I only wanted one nice picture of these five grandchildren together. Beth and I fixed this yesterday and it was fun to fix and good to eat. This was recommended on Who Cares blog. It was a huge hit with my family. Be sure and read Jessi's Friday 13th entry. Only Jessi could tell it so well! Tell me, is there a woman alive who can live without pockets? I have one pair of capri pants without pockets. Saturday they were all I could find to put on. It was a miserable day. You absolutely cannot follow around a pack of grandchildren without pockets. You are picking up every second and where do you put the small hair clips, discarded socks, bits of paper, donut and cookie crumbs and candy wrappers? Suddenly I remember my mother and her constant search for clothes with pockets. I thought she was crazy to always demand pockets. Now I know that my white capri pants were actually designed for a teenager and I bought them by mistake. We passed a small caravan of custom painted VWs. This was the one we all liked the most and this is the best picture I could get with my camera phone. 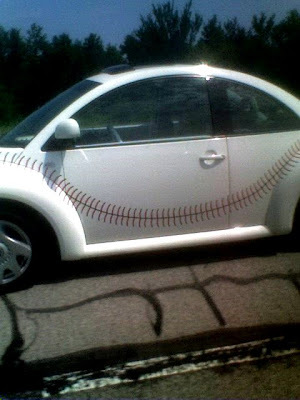 They had "Fastball" across the back. Wish I could have really captured how cute it was but you can get the idea. NEWS FLASH! 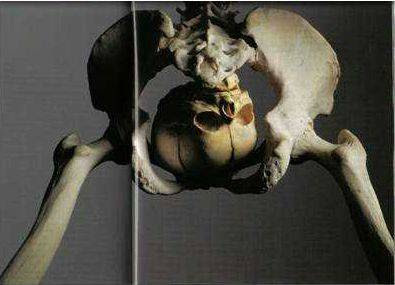 An archeological team digging in Washingtog D.C. has uncovered 10,000 year old bones and fossil remains of what is believed to be the first POLITICIAN! I do not hear from my brother often so when he speaks it's like E.F. Hutton -- everybody listens. I asked for some good Netflix movie recommendations and he suggested STRANGER THAN FICTION. But I don't like Will Ferrell. My brother said he didn't care much for Will Ferrell either until this movie. And so, being a good little sister, I ordered the movie. Now I might even count Will Ferrell as one of my favorite actors. Plus Emma Thompson was excellent but we expect that. Wish you (and Joey, Ian, Jasmine) were here. We wish you a special day. GIRL POWER! Yes son, I'm still a militant....and what I would not do for my kids! My mother, my sister, my sister-in-law, my daughter all work/ed primarily inside the home. I work/ed inside and outside the home. I was a single parent, head-of-household. None of us had/have time to protest anything. We are too busy keeping home and hearth together. Movies today all have undercurrents of fights for the downtrodden. The downtrodden homosexuals, the downtrodden non-democracies, all the downtrodden ethnic groups. When will there ever be a day for the downtrodden, tired, exhausted mothers and grandmothers who simply get by from day-to-day with no time for protest marches, parades and rallys? Would you ever watch a movie about someone championing the rights of a tired mother? I absolutely cannot burn my bra because it is too necessary to hold up my sagging _ _ _ _ _! We have learned that chicken eggs take 21 days to hatch. We know that our Silkie hen, Beulah Dean, sat on a group of about 20 eggs for 33 days, to no avail. The eggs not only didn't hatch, they began to explode under her. Then she sat on a second set of eggs for 21 days and hatched one little chick out of 13 eggs. We rejoiced with the arrival of that one sweet blond chick. Have you ever heard of hens suffering from postpartum depression? I believe that Beulah Dean's total of 54 days on a nest caused her to suffer from a hormonal imbalance. When I first saw her stomping on the chick I thought it was an accident. I pulled the chick to safety in the nest. Beulah Dean immediately began stomping the chick again, so I removed it to the safety of a box in the house. Beulah Dean went crazy looking for her chick and began a rampage, breaking the eggs of Curly, a hen sitting on eggs in the nest next to her. In a bad moment of becoming a bleeding heart, I believed the best place for this chick was with her mother. I returned the chick to the nest. Crazy Beulah Dean finished her off. It was a sad day. The biological parent is not always the best parent. It seems our state has come up with the answer to imigration and illegal imigrant concerns. What am I missing? Why can't we adopt this for the policy of the USA? I guess we don't want simple solutions. Happy Independence Day! 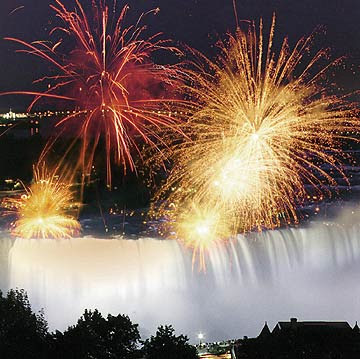 Wishing you a safe and happy Fourth Of July! Today it's about to go. This is the big iron bridge we fish under. As you can see from my camera phone photo, there is no going under the bridge now! The road on the opposite side of the bridge is also under water which means the homes of the people along the road are also flooded. 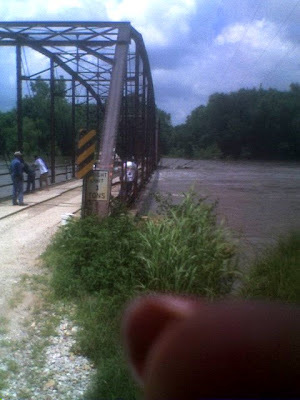 Everyone is speculating that the big iron bridge will not weather this flood. Regardless you can see people standing and fishing on the bridge. There was a roadblock and the sheriff was on the way to get them off the bridge. The county workers had tried to get them to leave but no one would listen. They did say I could walk down and take a picture but not to get on the bridge. Duh! We believe Big Darrell has serious intentions toward Elenore. At least we believe Elenore is attempting to charm him. We'll see what happens there. It looks like this will be Beulah Dean's only chick. We hope she will be willing to give up the nest this time. Leslie is a pretty little chick. It appears the other eggs were not fertilized which means Tiger Lily is probably nesting in vain. My new roosters need to get busy. We weathered the storms again today and went to Tulsa to see mother. She enjoyed hearing the email reports on her grandson Mike’s wedding. As much as mother, Ron and I would have loved to see the wedding, we were all equal in our relief not having to pack and schedule and travel, etc. Mother seemed so very content and satisfied with her current situation. She is enjoying the people who assist in her care and make her comfortable each day. I was happy with the fast response we had when we need assistance getting mother situated in her bed so she could watch church on television and sip the good hot coffee we brought her. Mother was surprised to hear about how much rain we have been having. She loved the fact that she was high and dry and didn't have to worry about chasing chickens. Tomorrow we must go to our place in Kansas and we truly dread what we will find. We’re hearing reports that everything in the area is under water. Speaking of chickens, we have discovered another one of the predators. Yesterday Ron and I actually witnessed the attack of a hawk on one of our Polish chickens. It was horrible but it was a spectacle to behold. Now we have pinpointed snakes and hawks for terrorizing the flock. Each predator is getting larger than the last. Whew, I dread the next one. It looks like Beulah Dean has only the one chick, Leslie. She still is sitting on 10 unhatched eggs and tomorrow I will have to remove them from the nest. She will have spent almost 55 days on a nest to come away with one little chick. At least she has this neat little baby to show for her fine efforts. We had a delightful, but brief, visit from my son Friday night. He managed to get here for me to feed him a nice meal, spend the night, eat a hearty breakfast, and then head back to tend to his dad’s medical needs. Parents may divorce each other, but their children can’t divorce their parents…..bless their hearts.